When our lung-ta is low, we feel unwell, ill at ease, uncertain and dull, and we find life more difficult. When we raise our wind horse, we become more positive and less lethargic, and can transform our problems into positive circumstances. . 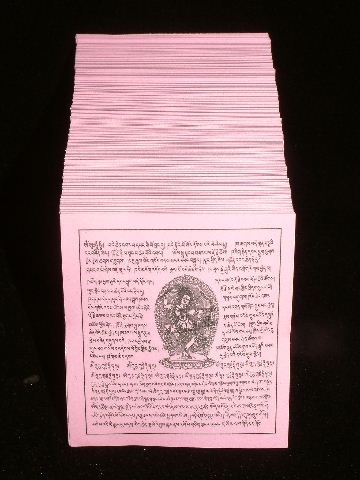 This Joss paper set is specifically for helping ourselves and others find love, protection and the blessings of Kurukulle. There are 1000 pages per set. It is the best Feng Shui tool, as it not only prevents the bad Chi but also transforms the bad into good. It is said that wherever the wind that touches them goes, it will carry the beneficial power of the prayers to any beings it meets. One can burn or throw them into river, sea or mountain.